Location, location, location! Located in the hermitage, cape corals premier gated community that offers some of the best boating access in all of sw florida! This estate home sits on an oversized lot with southern rear exposure and wide intersecting canal views that will take your breath away. Boaters will love the dock set upcomposite decking, 2 wrap around slips with 10,000 & 25,000 lb. Lifts, a covered boat canopy, and a massive entertainment area with a large tiki hut. This home was extensively remodeled by the current owners, using only the highest quality features and finishes, and it is being offered turnkey furnished to make your move simple. Features include luxurious custom wood cabinetry, 24 travertine floors, exotic granite counter tops, tray & coffered ceiling details, crown molding, custom built-in e-center with gas fireplace, built-in office cabinetry, gorgeous plumbing & lighting fixtures, and so much more! The original covered lanai has been converted to a/c living space to protect from inclement weather, or opened up to the pool area for outdoor entertaining. If you truly appreciate the highest levels of quality, this home is an absolute must see! $500k transformation is nearly complete on this entertainers dream home. Enjoy the beautiful wine bar before relaxing in the huge dining room. The all new kitchen has custom cabinets to the ceiling, coffee bar, massive island, 2 sub zero refrigerators, 48 wolf gas range, 2 dishwashers and a 5 double faucet sink. Polished marble floors were installed throughout including 3 ensuite bedrooms and five all new baths. The master wing offers a den, vast dream closet & gorgeous bath w/private courtyard. Custom ceilings, moldings & exquisite fixtures are found throughout. Step outside to a massive tropical retreat. Custom summer kitchen w/twin eagle grill, burners, griddle plus a full-size refrigerator & dishwasher. Gather around the fire pit or relax in the multi-level pool/spa. Enjoy the privacy of a custom enclosure w/down lighting. A 40 boat slip with 20k lb lift is minutes to the river. Park in an air-conditioned garage or an oversized detached garage for the toys. The largest lot in the community offers room to expand to a 4-car garage, guest house or both. Electric storm panels secure the lanai and a 22kva generator powers the home, all in the gated estates of cape harbour. 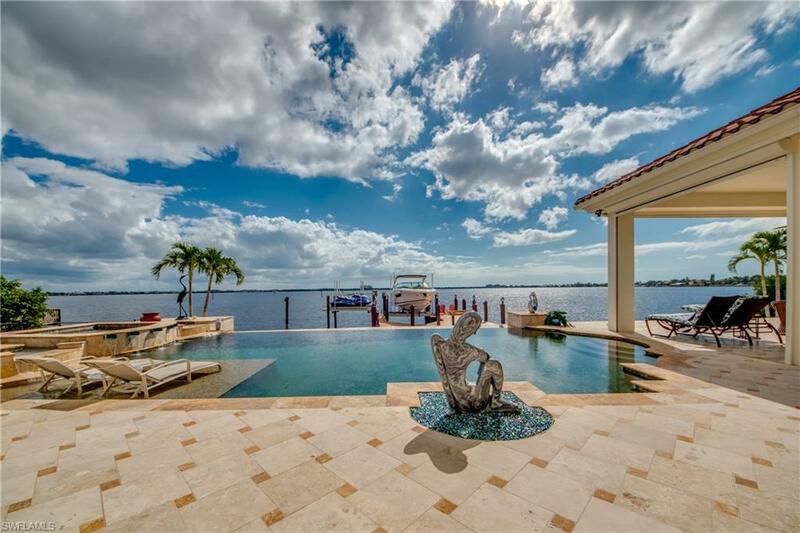 Captivating one of a kind luxury gulf access estate home, offering the most amazing sunrises! This stunning home has everything you have been looking for. Situated on over half an acre cul-de-sac lot really brings the wow factor as soon as you pull into your pavered driveway. Upon entering, you will be drawn to the sprawling living area with sliding glass doors immediately connecting you to all your swfl dreams. 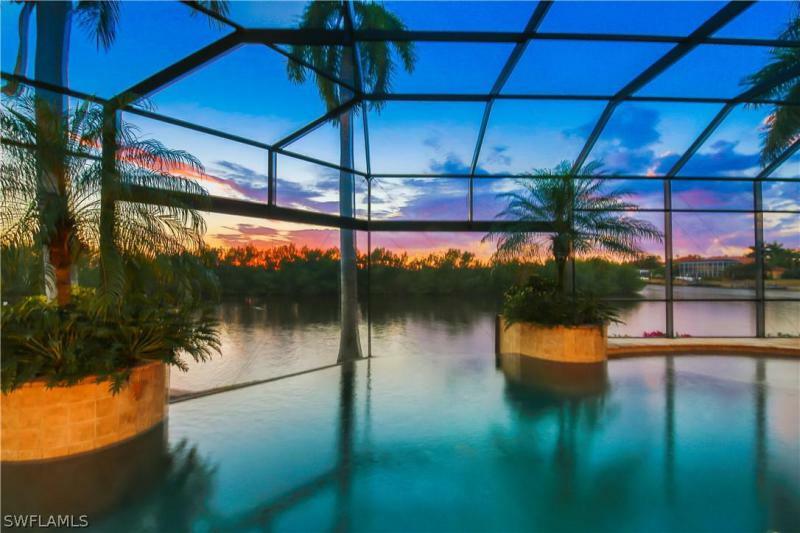 The oversized resort style heated infinity-edge pool & spa overlook 2 intersecting canals with over 350 of water views perfect for year around entertaining. This piece of paradise provides the extra space to accommodate your guests with a private double glass door entrance in-law suite for added privacy. Meeting your boat lovers needs, there is a canopy covered captain's walk dock, two boat lifts with a capacity of 7,000 & 10,000 lb, & there is also a jet ski lift! The expansive garage is a car collector's fantasy offering 15' ceilings large enough for 6+ cars. Carefree living is also offered with a brand new roof currently being installed. Located in the sought after area of sw cape coral close to fine dining & nightly entertainment. Stop looking & schedule your showing! Rare opportunity in the hermitage under $1. 5m! Cape coral's finest, premier gated neighborhood. Private paved streets with 19 spectacular homesites. 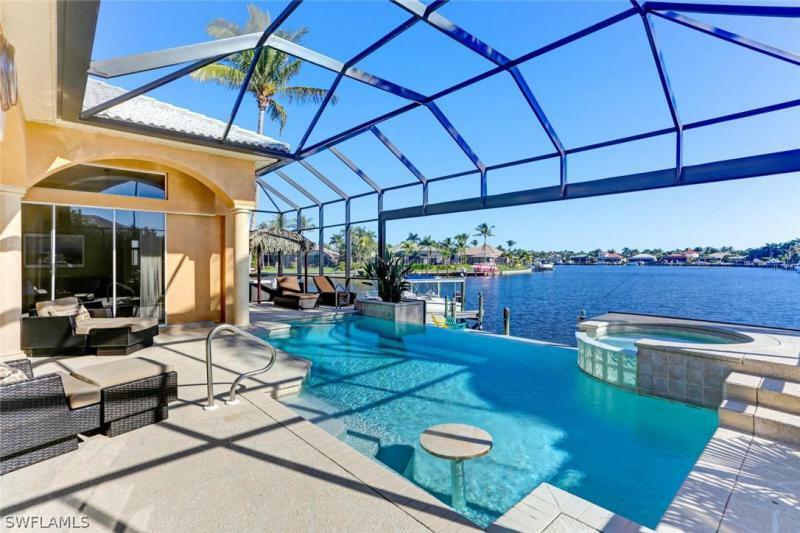 This home features direct sailboat gulf access on 200 foot canal, and amazing views, be in the gulf in minutes! This custom built home is located on the cul de sac, includes grandiose high ceilings throughout, four bedrooms, den, four bathrooms, 3-car garage, tile roof, paved driveway. Must see opportunity, super spacious, light and bright, chef's kitchen open to living area with views of pool and canal. Cook in comfort and luxury! Home also offers living and family rooms, eat in kitchen as well as formal dining area. Each bedroom has a private bath, and access to private courtyard or canal front screened patio. Decorators and designers dream palette! Lush mature landscape! Fabulous pool and lanai area, pool just refinished. Large boat dockage area features two docks a wide-beamed 40,000lb lift and a 10,000 lb lift! Come home to the ultimate community, beautiful gated entrance with fountain. Adjacent and walking distance to cape harbour dining, shopping and marina! Amazing house to make your own home, priced to sell, easy to show. Welcome to your forever home! Located in the luxurious gated community of cape harbour this house will meet all your needs. From the moment you walk in through the front door, you will experience the florida lifestyle you have been dreaming of and will provide the space needed to entertain all your friends and family. With a split floor plan, your guest have their privacy while still having the open living area and kitchen to gather, relax, open the sliders and let the outside in! The sellers spared no expense when providing you with peace of mind. Newly paved lanai, new screens on pool cage, completely new heated pool, new extended dock and boat lift, 2 new air conditioning systems, and water heater. Every boater & fisherman's dream with a 12,000 and 17,000 lb lifts, 140' of waterfront basin views and direct gulf access, it is just a short boat ride to open waters, sanibel and ft. Myers beaches. Nothing speaks lifestyle like living in cape harbour where you can walk over to fine dining and enjoy nightly entertainment. Call today to schedule your private showing.